For many growers, squash is truly among the hardest working and most productive vegetable plants in the home garden. Whether growing winter squash or a summer variety, the diversity among this family of plants is remarkable. Specifically, summer squashes are prized for their upright and bushy growth habit, as well as usefulness in the kitchen. Types such as straightneck are perfect for those looking to enjoy early season harvests from the garden without the stress of starting seeds indoors. Straightneck squash plants are a type of summer squash. Straightneck squash varieties bear small, yellow fruits with subtle flavor. As their name would imply, these squash plants have a straight“neck” which attaches to the plant. Summer squashes are ideal additions in areas with short growing seasons, as plants mature quite quickly. Straightneck squash is also a favorite plant for succession sowing and in the fall vegetable garden. As with any summer squash, straightnecks should always be harvested when young and tender. Growing straightneck squash is very similar to growing other varieties of squash. Tender to frost, it is imperative that all chance of frost has passed before planting straightneck squash into the garden. While it is possible to start squash seeds indoors, many prefer to sow the seeds directly into the garden. To direct sow, simply press seeds gently into the soil of a well-amended and weed free garden bed. Quick to germinate, seedlings often emerge within 5-7 days. 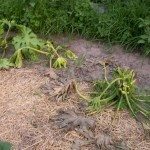 Throughout the season, heavy feeding straightneck squash will require frequent and consistent irrigation. Since overhead watering may lead to issues such as powdery mildew, avoid wetting the plants’ leaves. This will help to reduce the occurrence of this disease. Like other members of the squash family, straightneck squash may battle several insects and pests throughout the growing season. 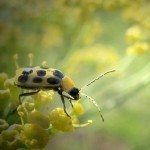 Some of the most commonly encountered include cucumber beetles, squash bugs, and squash vine borers. Infestations of any of these insects can lead to partial or complete loss of squash plants in the form of bacterial infections and wilt. Though sometimes difficult to control, vigilant gardeners are able to prevent excessive damage with close attention and monitoring of plant health.